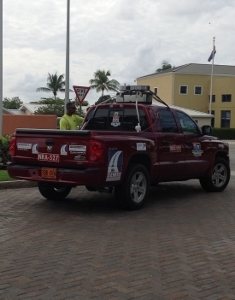 (CNS): A group of international road engineering safety experts are currently in the Cayman Islands conducting an assessment of the country’s 238 miles of road in order to measure the risk factors on the network and offer ways to mitigate potential hazards. Cayman has a very high road crash rate for the size of the country, double the World Health Organisation’s average with 16.5 people per 100,000 being killed on our roads annually. While many factors contribute to road crashes, experts from the International Road Assessment Programme (iRAP), which is partnering with the NRA on this project, say the only one that governments can manage is the road itself. The experts say that things as simple as better road markings, sidewalks and intersection design can significantly lower the risk to all road users, including pedestrians, cyclists as well as drivers. The National Roads Authority is using part of its roadsbudget for this financial year to pay for the assessment, which is costing around US$155,000 and will result in a full report on all the local roads and grade each one on a star rating — five star roads are the safest and 1 star the highest risk. With the help of the iRAP, local officials say they hope to upgrade all of the roads rated below three stars. While road improvements cannot stop drunk drivers, people texting at the wheel, speeding or poor standards of driving and road awareness, or any of the other variable that may cause smashes, better engineered roads can be more forgiving, experts said at a press briefing Thursday. In other words, better designed and engineered roads can reduce the likelihood of accidents but when collisions still occur, as they will, those involved are less likely to be killed. Kurt Tibbetts, who is now the minister in charge of roads, explained that the works ministry had been keen to undertake the assessment because of the number of fatal smashes on Cayman’s roads and the emergence of some specific places where crashes were happening more frequently. “It was felt to be in the country's best interest to do a road assessment in order to determine what actions needed to be taken to mitigate accidents at specific locations,” Tibbetts said Thursday as he pointed to the grief suffered by families when they lose loved ones on the roads, as well as the medical expenses for those badly hurt and the loss of productivity to the country and earnings to families. He explained that iRAP would not only assess the roads but also pass on expertise to the NRA team, offer technology advances, cost effective solutions and tracking on the road network performance when enhancements are in place. The minister said that some changes could be very cheap and simple but still save lives, as he noted that at present some 50 countries are engaged in a similar exercise with iRAP. Using a special vehicle equipped with specialist gizmos and techy equipment, the NRA and iRAP have already begun taking the measurements. Once completed, a report and star rating will be given on all roads and the non-profit organization will then offer recommendations and solutions, which Tibbetts said would be implemented by CIG as money became available. The iRAP focuses on 30 design features that influence crashes and the severity of crashes. The experts said they had already spotted issues in Cayman relating to a lack of sidewalks and delineation on some of the roads as well as light pole spacing on fast roads. Acting NRA Director Edward Howard said he was delighted that the ministry was supporting the initiative as it would give the authority a comprehensive safety measure of all the roads. The end goal was to ensure high risk roads were eliminated, he added. Howard explained the assessment was part of the so called ‘4Es’ relating to road safety (education, engineering, enforcement and emergency management) and this was the engineering part. Another accident on Spotts raceway on Shamrock Road. Fortunately no one was killed this time only taken to hospital. Most dangerous stretch of road in the country. Only because the government sees fit not to impose any lane discipline, i.e. 2nd lane should be for overtaking only – not for idling along at 25 mph in. This in itself would fix many of the problems experienced on that particularly bad stretch of road – but its only bad because of the way it is driven and could easily be rectified. And how long until the police enforce roundabout discipline? Because that is another major cause of accidents in Cayman – nobody knows which lane to be in despite us now having clear guidance in the Road Code. The unhealthy mix of UK and US road rules and road users doesn't help matters either. I think there are several hard issues that need to be examined, that have ssemed to be ignored. Drinking age is too low. Putting an 18yr old behind the wheel after they have legally consumed isnt the brightest idea. At that age, teens tend to be irresponsible and have a feeling of invinsiblity. I am almost certain that nothing will be done to address this issue, as too much money stands to be lost in the bar and night club sectors. Driving age too high. This works in conjuction with point #1 – 1yr of experience behind the wheel before they are able to drink. What is really frightening is how many are drinking before the age of 18. The main problem apart from the bad driving standards irrespective of where you come from is that the powers that be have not made up their mind as to wether we follow UK traffic laws or American traffic laws. We have a situation whereby people can freely import any car they like not considering the fact that we drive on the left, so steering wheel on the right. Added to that two lane roads such as the new one into West Bay which is treated to the American system of two travel lanes, not the UK system of the left lane for driving and the right lane for over taking. To cap it all, we purchased over priced and over powered American cars with the steering wheel on the wrong side. Oh and I forgot to add we need speed signs that have both mph and kmh on them. Correction – in the US in terms of multiple lane highways, the outside lane is used for slower moving traffic and/or exiting, where the inside lanes are used for passing. There are many more "overpowering" japanese and german vehicle on the road, seems as if you have something against the US? But I do agree that there can not be a mixture of driving practices in one country, it must be black or white. You the local GM dealer? It is dangerous to overtake using a car that has the steering wheel on the wrong side for the traffic flow. The selection of police vehicles is indeed something that should be openly questioned. It is nothing to do with feelings about Americans (who I happen to be rather fond of as a nationality). Yet another waste of money! Just to have someone appear to be doing their job. Roads don’t kill people, stupid people and intoxication does. I have been driving for over 20 years and involved in two accidents both of which, were the result of someone else’s stupidity namely intoxication. The government could reconfigure all roads in Cayman to be 10 miles per hour and you will still have accidents as long as people continue to drive erratically. they will do it more effeciently and will free up the police for real police work….. I think that the RCIP should be working along with NRA. Reports should be given to NRA from the RCIP on a monthly or quarterly basis. The frequent areas should be give high priority attention. Many people have lost their loved ones and or came very close on these roads. If stats is given from the RCIP/NRA one would be very surprise that someone they knew had an accident in that same very spot year after year. Is anything being done to fix those particular areas? It's proof that nothing is done when there is many other car accident being reported from the same spot. What about what's not reported. A survey should be put out there for the public to say where need to be fixed. As previously said above, many have lost their loves ones and or came close to Cayman roads and they would like those area fix to avoid other deaths. Let's stand together to fix this issue!! It's everyone's problem. Anyone mention those lovely drivers that need 4 car lenghts in bumper to bumper traffic to stop? Guys if you need that much stopping distance then you should not be on the road. An average car is 13ft 6in in length. 54 feet is the stopping distance for about 22mph. You are a fool. so when in bumper to bumper traffic per the OP, so speed is aound 2mph, and you need a stopping distance of 54 feet, wow. So bumper to bumper speed is 22mph. And you call me a fool. And at 22 mph you need half a house lot. It is like everything else in Cayman, there is no rule of law. Be it traffic law or anything else. Many people drive like dangerous fools and basically do whatever they want. Who doesn't have stories of near misses or incredibly dangerous driving with complete disregard for everyone on or near the road? Don't get me started on drunk drivers. This will be a ton of cash spent, a report produced the. Govt won't like and nothing will come of it ! Badly made roads initially made worse by poor repairs. Slippery surfaces, adverse cambers and poor drainage. Poor placement of roadsigns creating blind spots, weird sharp approaches to roundabouts, 4 way stops instead of roundabouts and vice versa…the list goes on. Thats before you add bad driving to the mix! Those tires will wear down a lot quicker now driving to West Bay with all the round abouts on the Dart speeway. The Oblong-a-bout will eat them up. The iRAP can marvel at the road engineering leading into the Strand – it's more gravel patch than pavement! The Govt. should be talking to the owners…and find a way to cause it's upkeep! Afterall, how busy can the NRA be these days? They're certainly not doing much actual roadworks! It's a piss poor impression to residents and visitors alike! Roundabouts in Cayman are to slippery when wet, a company was brought in to groove the road but it was grooved length way instead of cross way. Runways are grooved crossway and this works well. If you want to save lives then install speed bumps on all roads or require governers on all cars that limit top speed to 40 mph or so. That way you take control away from the idiots. Speeding trucks are the worst culprits, apart from brainless boy racers in their silly souped up hondas. I hope that they look at the roundabout near Hurleys and the two further east on the byepass as they are as slick as ice whenever they are wet. I use them every day and have seen many vehicles slide sideways even at low speed. It has happened to me twice as well. The following things all happened in one journey yesterday: a taxi pulled out in front of me from a give way so that I had to do an emergency stop (he was looking right at me at the time); a pickup came right around the outside lane of the butterfield roundabout as I was trying to exit from the inside lane and missed me by about an inch; twice vehicles I was following suddenly braked hard and turned off the road without indicating; a car went through the lights on Shedden Road as they turned red. Two other cars followed it; I got stuck behind a taxi doing 18mph for no apparent reason; I had two swerve around a bus that had stopped to drop off passengers in the middle of the road, AND around a gentleman who was standing in the road having a chat to someone; then a silver BMW overtook me and 3 other cars (by going about 80mph in the wrong lane) on South Sound Road. The road layout is NOT the problem in Cayman! WOW: what an indictment about driving standards, which are generally appaling. One comment, however: in the second incident you described, you would have been safer had you been in the left (outside) lane before exiting: that way you would have avoided the near miss wirh the idiot wh almost clipped you. Especially since the "idiot" in the outside lane has right of way over anyone in the inside lane trying to exit. No he didn't. I was already on the roundabout when he entered it. That means he had to give way to me. You are completely wrong there. You can use the outside lane if you're taking the first exit, either lane if you're taking the second, and the inside lane for anything after that. You have to give way to any vehicle already on the roundabout. That's anything that's coming around while you're waiting regardless of whether they're in the lane you plan on using or not. And you NEVER change lanes on your way around. I was taking my second exit. The person who cut me off was going past that exit in the outside lane. So either he came into the roundabout in front of me from the first exit I passed,in which case I had right of way, or he was in the wrong lane. The only way someone can go around the outside of you is if (i) you are using the inside lane but taking the first exit, in which case it's your fault; (ii) they enter the outside lane at the same point you enter and are not taking any of the first 2 exits in which case they're in the wrong lane; (iii) they enter from one of the exits you are passing in which case you have the right of way since you're already on the roundabout; (iv) they come flying up behind you and are trying to pass on the left in which case they're mad. And this goes on day and night 365 days a year. The "enforcement" part of the "four E's" is sorely lacking! And the atrocious quality of patchwork, coupled with poor re-surfacing is another factor (check Cayman Kai road). But the lack of meaningful and consistent enforcement is paramount! 10.42 So you had a normal day, then? I don't think the roads are the problem! What?! $155 000 of MY hard earned money to use some simple common sense and thoughtful planning? Areggghhhhhhhhh, sack the entire Roads Authority staff please. WHY are we now paying experts for our paid fools to fail (again). Where are the rolling heads? Bloated civil service and we now pay 155k to outside experts? Ridiculous, just stupid. Since a fatal accident costs about $1m, this seems money well spent. Good, well done CIG. I was driving in today thinking how bad the roads are: deep water collecting, uneven surfaces, poor traffic flow & use of traffic lights, slippery surfaces. The main problem is idiot drivers though. No applause for the CIG that spent a fortune of our money on deficient infrastructure. Two words: Boy racers. That probably sums up the majority of road accidents in Cayman. And now, thanks to the new Batabano bypass, I can lie in my bed and listen to these arseholes gunning their cars up and down the road during the early hours of the morning. I wait in anticipation for the sound of the crash, so that my sleep can then be disturbed by wailing sirens and flashing lights. It would appear the NRA have never had the engineering knowledge or coding guidelines that are found in urban settings. As density has increased the knowledge base has not kept pace. Even newer roads like upper ETH have heaves and bumps from insufficient grading and anchoring of substrate. Not for lack of spending however. Pulling out from Cimboco's is horrible for this, there are always cars outside parked on the road and you really have to push out to see if anything is coming. Nothing wrong with the roads or roundabouts, its the Dumb half wit people that can't drive! Nothing really changes, I just noticed that Rotary has installed bus shelters on the bypass between Lime Tree Bay and Fosters! Now we will have the idiot taxi drivers stopping on a two lane highway to pick up passengers. Classic.You cant make this stuff up. Especially when this is also the stretch of road used by people living off it who cycle/ run/ walk their dogs/ push their prams and there is no proper and safe walkway. This is a serious accident waiting to happen as drivers already swerve off the road onto the hard shoulders to avoid the speed strips leading up to the roundabout. That swerving malarky cracks me up. It appears many try to avoid every bump, pot hole, rumble strip, leaf, ant,amoeba….I can't fathom why. What do they think will happen if they just happen to drive over a little bump? Oh no, my wheels/doors/arms/legs/false teeth fell off! Oh, wait, no, they didn't. My favourite to watch is the slight corner heading south by Treasure Island. It is like watching F1 cars warm up before a race. Funny things is, someone must have taught people to do this. Well, whatever, this topic is always the most commented on here, yet nothing ever gets done. i'll just drive accordingly knowing it is a problem, keep my distance, be wary of you all, and try to not let it get to me before I have a stroke. I had a Hummer almost hit me as it swerved on my side of the road to avoid a puddle. I swear there is a 8 year old with a Lego set deciding the road set up. The lack of common sense makes me dizzy! Actually ask a 8 year old and they will tell you that trucks should be forced to use all bypass roads (I hate getting behind a gravel truck on the seaside road in Spotts while the bypass roads are empty?). How about low speed limit on Queens Hwy, (speed trap on open empty road) but 50Mphright by Rum Point! Huh? SMB still over 35mph? Huh? How about monthly town hall meetings for road improvement suggestions? My spouse would attend every one! Come on, Roads Authority- hire an 8 year old or get some common sense! The trucks shouldn't be using the bypasses as the bypasses should be two lanes and have a higher speed limit. While I'm well aware that some of trucks do these higher speeds it is really annoying to go down a straight piece of road where the speed limit is 40mph and be forced to do 25mph because a big overloaded truck is using the road. the question is…why was it not properly included in the original design???? Mandatory 90 days jail for DUI and driving without insurance might bring the death down to normal third woirld levels. Too much darn dual carriage roundabouts and clueless residents and tourists alike who don't know how to use them properly. As a tourist, I know how to use the roundabouts as we have rotaries back home, BUT what the heck is with the yellow warning system on the new crosswalk system on 7MB….to me yellow means slow down not stop. I mean, of course I did stop, but it was confusing at first what was the proper thing to do….slow down, stop especially since the person was already thru the crosswalk. This may be a good thing to have rental cars go over?? I also think more lighting on West Bay Rd. in certain areas…that road can be dark. If you drive around any of the three islands you see shrubs, trees, walls etc existing way too close to the road. This is especially hazardous when a driver entering a busy road from a side road or parking lot is prevented from seeing approaching traffic because his view is obscured by hedges, walls and the like. I have seen countess cases where a road right-of-way is gazetted for, say, 50 feet and the paved ares is, say, 25 or so feet wide that walls, fences, hedges, and the like are well into Crown Land on the shoulder of the road. You have to place your vehicle well into the traffic lane to see what's coming before pulling out. Several times I have almost been hit. In certain places this is a horrid hazard and will one day (if it has not already) lead to a serious accident or loss of life. Who has to die or get seriously injured before something is done about this situation? I am beginning to take photos and make sketches to record the worst of these spots with a view to making sure that those assessing our roads are made aware of this situation so they can look out for such hazards and report accordingly. As Crown owns the entire width of the gazetted right of way, this is a hazard that can be easily eliminated. Give the owners notice to more or remove the offending obstructions like fences or plants and after the appointed time expires, bulldoze or chop the obstruction to away. Any traffic expert will tell you that obstructions to line of sight of approaching traffic is extremely dangerous. What the hell is the idea of citing people for not wearing a seat belt or for talking on a cell phone when the Cayman Islands Government is the host to hazards that are at least or even more dangerous? Someone needs to clamp down on Government for allowing these all-too-common dangers to life and limb to exist on government land. Anybody care to weigh in on this? The other issue I've found is that with a large percentage of left hand drive cars on the road those obstrcuted views are even more dangerous. A visibility splay or road design is usually based on a lot of factors, one is an angle of sight from the position of the driver, move the driver to the other side of the car and the road design would have to change. It's not a problem in many parts of the world as people have access to the correct 'handed' vehicle for their country and the exceptions are just that. When you have a high percentage of vehicles using roads not deisgned for them the outcome should be obvious. Dart is a culprit of the over-planting on and around roundabouts as well as NRA. The whole point is to be able to see what's coming and keep going if safe to do so, not to have to grind to a halt because you can't see a blessed thing because of bushes. And while on the subject of Dart – leave the blasted trees on Solaris Avenue alone! The poor things can't go a week without a posse of men chopping off branches in an effort – presumably – to sculpt them into some tortuous shape. Apart from it being a complete waste of manpower, it probably constitutes Cruelty to Trees. I expect there's a Society. I hope they do something about the defective road surface on the two roundabouts east of Hurley's that turn into an ice rink with a drop of rain. Why on earth someone has not fixed this is beyond me? But no, stick up a sign instead that pre warns the driver that you might want to take it easy through here or you might end up upside down in the mangroves just like the dozen cars before you! Why hasn't those two RB been fixed?! Because that would be admitting that mistakes were made!!! So, don't hold your breath on that being addressed. Funny thing is that NRA designed and built these roundabouts with "tax payers" money. These roundabouts are designed with the wrong camber for drainage, they typically are supposed to be shaped like a bowl, so surface water can drain inwards into a drilled deep well system. Let the experiencedroad construction companies build our roads, I am sure they can do it a heck of a lot cheaper than a government department too! Hopefully nobody has to go to heaven to right that? Interesting. The surfaces have been grooved. I have never had an issue travelling around these junctions in rain or shine. Maybe because I use a safe speed? it is no rocket science to find faults on cayman road, example why there is no side walk between beach bum shop to cabana bar. yet paying someone $155,000 for their advice?!? Also that bobby thompson traffic light junction should be a roundabout as I have seen too many idiots jump red lights as they are signing their own death wish! Which MLA do we complain to? They could have asked for public input and got the problems listed for free! I just rattled off 5 problems with the roundabout alone. Why so much money to tell us what we know? Crappy driving as those with no respect for others take advantage of weak enforcement! First smart and original thing this government has done. But most of the problems could be addressed by "speed" cameras (these days cameras can do more than issue speeding tickets, they can check license renewals and catch drivers on the phone). The revenue from tickets would more than cover the cost. Simply have them drive on the Spotts raceway any time of the day and night to experience the lack of traffic laws. There was just another accident the other morning. That 2nd lane west was a checkered flag for speeding and racing. The raceway deathtrap in front of Ocean Club has been a battle for attention for years!! The Govt completely IGNORES that glaring problem! Hello Roads & Planning? Wake up! There is a perfectly good bypass just feet away, yet all big trucks go through Spotts? Huh. WHO is going to address this?? !